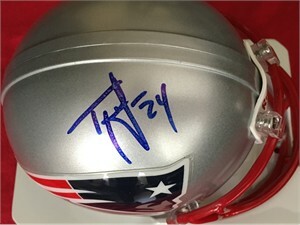 New England Patriots Riddell mini helmet autographed in blue Sharpie by former Pro Bowl cornerback Ty Law. Obtained in person, with certificate of authenticity from AutographsForSale.com. ONLY ONE AVAILABLE FOR SALE.